TradersEquity TraderAn equity trader is someone who participates in the buying and selling of company shares on the equity market. Similar to someone who would invest in the debt capital markets, an equity trader invests in the equity capital markets and exchanges their money for company stocks instead of bonds. Bank careers are high-paying and analysts constantly study trends and patterns when watching the market, in hopes of detecting the next most probable price movement. Spotting and correctly identifying patternsTechnical Analysis - A Beginner's GuideTechnical analysis is a form of investment valuation that analyses past prices to predict future price action. Technical analysts believe that the collective actions of all the participants in the market accurately reflect all relevant information, and therefore, continually assign a fair market value to securities., and understanding their significance, is vital to successful trading. The head and shoulders pattern is important is valuable because of its longstanding history of reliability among market analysts. Below, we’ll discuss this pattern in detail, explaining its significance and how you can profit from using it. In terms of technical analysis, the head and shoulders pattern is a predicting chart formation that usually indicates a reversal in trend where the market makes a shift from bullish to bearishBullish and BearishProfessionals in corporate finance regularly refer to markets as being bullish and bearish based on positive and negative price movements. A bear market is typically considered to exist when there has been a price decline of 20% or more from the peak, and a bull market is considered to be a 20% recovery from the bottom, or vice-versa. This pattern has long been hailed as a reliable pattern that predicts trend reversal. Before we continue, it’s important to keep in mind that the head and shoulders pattern is almost never perfect, meaning, there will likely be small price fluctuations in between the shoulders and the head, and the pattern formation is rarely perfectly shaped in its appearance. There are three main components to the head and shoulders pattern. Before we explain each part, take a look at the picture below. This picture is a clear representation of the three parts of this pattern: two shoulder areas and a head area that price moves through in creating the pattern signaling a market reversal. The first “shoulder” forms after a significant bullish period in the market when price rises and then declines into a trough. The “head” is then formed when price increases again, creating a high peak above the level of the first shoulder formation. From this point, price falls and creates the second shoulder, which is usually similar in appearance to the first shoulder. Importantly, the initial decline does not carry significantly below the level of the first shoulder before there is usually either a slight retracement upward or a flattening out of price movement. The pattern is completed, giving a market reversal signal, when price declines again, breaking below the neckline. The neckline, as depicted above, is the horizontal line that connects the first two troughs to one another. Head and shoulders patterns can also form in the opposite direction, signaling a market reversal and trend change from bearish to bullish. This is commonly known as an inverse head and shoulders pattern and, simply put, it is essentially the exact opposite of the pattern we just described – or in other words, an upside down head and shoulders pattern. The inverse pattern is therefore a signal that the market is transitioning from a downward trend into an upward trend. With the inverse head and shoulders pattern, stock prices will dip into three lows that are separated by two temporary periods of price rallying. The middle trough, which would be the head of the inverse pattern, is the lowest, while the shoulders are somewhat less deep. Once the second shoulder has formed, prices will make a final rally, breaking above the neckline and indicating the bearish trend has reversed and that bulls are likely taking control of the market. The head and shoulders pattern is favored among traders because of its unique ability to help them determine price target estimates once the pattern has completed itself and the neckline has finally been crossed. It also makes it easy for traders to place stop-loss orders. 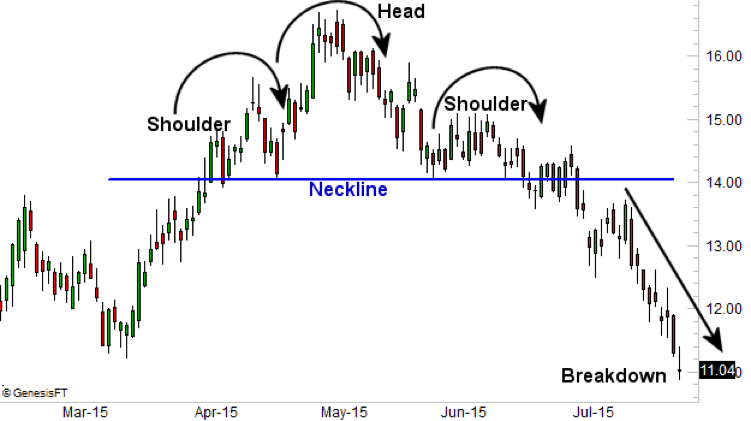 In the case of a peaking head and shoulders pattern, stops are typically placed above the top-of-the-head high price. With an inverse head and shoulders pattern, stops are usually placed below the low price formed by the head pattern. In order to estimate how much prices will move after the neckline is broken, you need to return to the pattern and measure the distance, vertically, from the top of the head to the neckline. Then, simply subtract that same distance from the neckline in the opposite direction, starting in the spot where prices first crossed the neckline after the pattern has formed its second shoulder. For example, if the distance between the neckline and the top of the head represents $20 in the price of a stockStockWhat is a stock? An individual who owns stock in a company is called a shareholder and is eligible to claim part of the company’s residual assets and earnings (should the company ever be dissolved). The terms "stock", "shares", and "equity" are used interchangeably., then once the neckline is broken, analysts would project the stock to decline in price at least another $20 below the neckline price level. This is just an estimate, however, many traders trust the number and move forward with the belief that prices are likely to decline at least that much. When dealing with a traditional head and shoulders pattern, you’d be measuring the vertical distance from the top of the head down to the neckline, enabling you to determine an estimated spread amount as we just discussed. Of course, when dealing with an inverse pattern, the opposite is true. Measure the vertical distance from the top of the head up to the neckline, giving you a rough idea of how far prices are likely to move up past the neckline. Before making any trades, it’s important to let a head and shoulders pattern complete itself. If the pattern seems to be forming, or is in the middle of forming, you shouldn’t assume that it will fully develop and make trades based on what you believe is going to happen. The market can be fickle and changes at the drop of a hat, so remember to watch trends as they develop and be patient. Try to avoid getting caught over-anticipating. Plan your trades ahead of time so you’ll be ready to move forward once the neckline is broken. Watch for variables that might make it necessary to change your entries, stops, and profit targets. There is an alternate entry point that traders often pick, however, it requires due diligence, patience, and quick action at the right time. Traders taking this alternate approach watch the pattern and – after the neckline is broken – wait for prices to retrace upward to, or to slightly above, the neckline level. This is a more conservative trade that often allows a trader the opportunity to enter at a more favorable price. However, there’s the possibility that you might be waiting for a retracement that never develops and thus miss the trading opportunity altogether. At the end of the day, it’s important to stick with trades that respect your risk tolerance and help you achieve your trading goals. The head and shoulders pattern has been historically shown to be a fairly reliable one in a space that is characteristically unpredictable. It’s also one of the most easily recognizable chart patterns. No chart pattern is an accurate predictor 100% of the time, but when the head and shoulders pattern correctly signals a major trend change, it represents a correspondingly major profit opportunity. TRIN IndicatorTRIN Indicator - Technical AnalysisThe TRIN indicator is short for trading index. The TRIN indicator, also known as the ARMS index because it was developed by Richard Arms, is functionally an oscillator type indicator that is primarily used to identify short-term overbought or oversold conditions in the stock market.